Think film noir is always in black-and-white? Well, think again. Now making the rounds on the Noir City circuit, A Kiss Before Dying (1956) sparkles in glorious De Luxe color and CinemaScope. As part of Noir City’s focus on the fifties, I caught it in San Francisco and again in Hollywood. 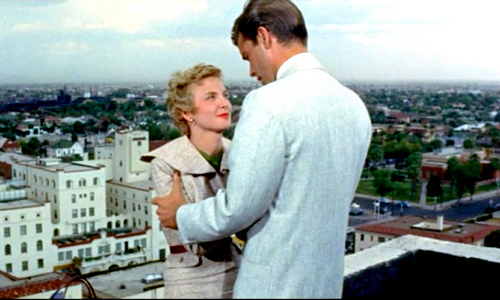 It’s a standout in the series and marks the second film for Joanne Woodward. In San Francisco, Eddie Muller spoke of how the widescreen (scope) aspect ratio came about in the 1950s as a way to compete with television, giving stay-at-home viewers something impossible to get on their nineteen inch Philco black-and-white sets. Adapted from the first novel by Rosemary’s Baby author Ira Levin, “Daryl Zanuck bought it at 20th Century Fox specifically for Robert Wagner to play the lead. The three main actors, Robert Wagner, Virginia Leith and Jeffrey Hunter were all under contract to 20th Century Fox but for various reasons the picture never got made at Fox. It ended up being made independently at a company called Crown Pictures, but Zanuck loaned out all of those actors to appear in the film. Directed by Gerd Oswald (Screaming Mimi ), the film looks beneath the veneer of 1950’s conformity and status seeking. At twenty-five, Bud Corliss (Robert Wagner) is good-looking with slick hair and nice clothes. No ordinary striver, he’s a sociopath who’ll do anything to get ahead. After a couple of years in the service, he has some catching up to do. In Psycho (1960), there’s a sweetness to the Norman Bates character who battles his inner demons. By contrast, Bud is pure calculation and control. He lives at home with his doting mother (Mary Astor) while attending college. It’s a time when male students still wear coats and ties to class. The young women are also formally attired by today’s standards. Bud sleeps with and knocks up wealthy sorority girl Dorie Kingship (Joanne Woodward). The clingy blonde is a means to end for Bud. What she lacks in looks and personality, she more than makes up for in stock options in daddy’s copper mine. Then, the inevitable happens. An unwed pregnancy is a problem today. In the repressed fifties, it was a near death sentence, at least for the girl. In this case, maybe literally. Shot by veteran cinematographer Lucien Ballard (The Wild Bunch , The Getaway ), he uses the wide screen to full advantage. Watch for the harrowing exterior scenes, on a rooftop and at the copper mine, which may induce “vertigo” in sensitive viewers. Muller considers the 3 minute 26 second take early in the film as impressive as the opening scene of Touch of Evil (1958). The night scene [where] Ellen confronts Dwight shows the most noir style in the film. She is shot high overhead as she walks toward a bar and then crosses a wet street to an alley. There Ellen is framed close up against a brick wall, her head’s shadow looms behind her, and another shadow angles across her chest. Presumably, the imagery presages her death because, if Dwight had killed Dorie and if he sees Ellen, then he will kill her, too. Dwight does see her, and he chases her to the end of the alley, where a huge diagonal shadow runs down the wall and over her entire body. Some critics have commented on the possible meaning of the colors of Ellen’s outfits, alternately white, striking yellow or muted pink. We’ll let you decide the psycho-sexual implications. The violin-drenched score by Lionel Newman adds to the emotional punch. There’s also a theme song that’s played or hummed throughout the movie for comic relief. Smokey-voiced Leith (Fear and Desire , Violent Saturday ) is an excellent noir heroine. Her timing wasn’t right, however. The era of the sultry brunette was coming to a close along with the demise of film noir. Her studio contract wasn’t renewed, but she had a long career working in television. A popular leading man of the 1960s, Jeffrey Hunter ( King of Kings ) plays Gordon Grant, a police trainee who helps Ellen unravel the case. There’s a an obvious attraction with her that may be consummated once the curtain closes.